It’s been nearly three years since my sister-in-law Angela called to inform me that my youngest brother Richard was heading to the Mayo Clinic to get a second opinion to confirm his Alzheimer’s disease diagnosis. I remember it vividly; the news stunned my family. We had no family history and no connection to Alzheimer’s. ‘How could this be?’ I thought. ‘He’s only 53!’ A few days later, the phone call came from Rich, confirming the diagnosis. He explained that he had cried it all out and was going to take a positive approach with his journey. He was optimistic and shared that he was overwhelmed by the outpouring of love and prayers from family and lifelong friends. It was official: Rich was going to take it one day at a time. Janice with her brother Richard. Alzheimer’s has surrounded me for nearly three decades. As a human resources director for Brookdale Senior Living, I am all too familiar with the disease from the training we’ve provided our associates over the years. I’ve seen many residents face the illness and have watched as the faces of their family members become unfamiliar. The idea that my own family is going to realize this is heartbreaking. Ironically, during the timing of this news, I had been asked by my executive director to lead the charge in working closely with the local Alzheimer’s Association chapter to organize a team for the upcoming Walk to End Alzheimer’s. More passionate than ever, I jumped at the chance. My community involvement through the years had been extensive, and fundraising for various charities had always been something that came easy to me. Networking and raising awareness for a cause that I believed in was a no-brainer, especially when it involved a family member. Our committee came together and we planned our first fundraiser: “Brews & BBQ.” The committee members were my Brookdale family. The event was held at a local beer pub where my daughter worked on weekends. We asked a friend who had a barbecue business to cater the food, and discovered he, too, had ties to the disease. When we asked for silent auction items, no one said “no” to our requests. We were stunned to find that so many of these small business owners had a connection to Alzheimer’s as well. The event had a great turnout and we raised nearly $4,000! The Walk to End Alzheimer’s team. We ended up having one of the largest teams at the Walk to End Alzheimer’s, raising nearly $5,000, and we were recognized as one of the top teams. The results fueled our committee to raise even more money this year. Our second annual Brews & BBQ moved to the barbecue owner’s venue, and live music was provided by friends who were musicians; we raised $7,000! Our Brookdale community associates held monthly fundraising luncheons, bringing our total to $10,000 – and halfway to my personal goal. This past June, my brother, who lives in Colorado Springs, came to visit my family for three weeks. At first glance, you wouldn’t really notice any changes. He was in good spirits, conversational and enjoyed one of our luncheons where we had raised over $400. He was proud to see my involvement with our local Alzheimer’s chapter, just as I was proud to help lead the charge in his honor. But the signs are there. Rich is learning to navigate the daily tasks we all take for granted. He asks for help when he needs it, like making change at a convenience store or packing his suitcase. Rich is enjoying a visit from his daughter who recently moved to Germany, and her son (his first grandchild) who was born last December. This past year he’s traveled to Mexico, Washington, D.C. and to visit his oldest son who’s in the Navy and stationed in Japan. Our dad, who talks to my brother daily, notices the slight changes with every phone call. But, again, Richie is determined to live his life and take it one day at a time. In August, Corpus Christi was in the path of Hurricane Harvey. The Coastal Bend area was greatly affected by the storm, as was most of Southeast Texas. This caused the Walk to End Alzheimer’s to be rescheduled for December 3. The impact of the storm has affected our fundraising efforts as well. We had planned our first annual “A Shoot to Remember” – a sporting clay event in November when we were hoping to raise another $10,000. The committee decided to postpone, so we are looking forward to making this event a reality in 2018. Like my brother, I don’t quit. I’m determined and will continue to raise awareness and funds for the Alzheimer’s Association so others can live their lives to the fullest, too. I quickly learned that once you’ve been personally impacted by this disease, a team effort best enables us to pursue the fight against Alzheimer’s. We are taking it one day at a time…and we are all in it to end it. About the Author: For the past 30 years, Janice Cagle has had a front-row seat when it comes to seeing the impact of Alzheimer’s. As a human resources director at Brookdale Trinity Towers in Corpus Christi, Texas, she knows how the disease can affect both those living with it, along with their loved ones. Now, she’s seeing it even closer as her brother has been diagnosed with the disease. Now, Janice is even more determined to make a difference through the Walk to End Alzheimer’s. We spoke with Mal Young, Executive Producer and Head Writer of The Young and the Restless, about the upcoming Alzheimer’s storyline centering on Dina Mergeron and the Abbott family, which begins Friday, November 17 when Dina’s family learns of her diagnosis. The daytime drama is in its 45th season on CBS. Many of the cast and crew have been impacted by Alzheimer’s, including Mal, who lost his mother to the disease, and participated in this year’s Walk to End Alzheimer’s to show their support for the millions of people facing the disease. Firstly, Mal, we are sorry to hear about the loss of your mother. Surely she would be so proud that you are addressing the Alzheimer’s crisis publicly and head-on. What was life like with her, growing up, and then after her diagnosis of Alzheimer’s? The Abbott Family of Y&R. I had very humble beginnings in Liverpool, England growing up with my older sister. My mom worked in a cake shop and my dad was a milkman. Although we lived modestly, we were exceptionally happy. My parents gave me my love of television, being huge television watchers in 1960s and 1970s. In 1960, the British soap opera Coronation Street (which is still running today) began. My mom watched every single episode every day of the week until the day she died. I was bound to – and born to – work in soap operas, as I grew up in a home and society where these shows were such a huge part of life. I am a lifelong storyteller because of my upbringing. When my dad died, my mom truly fell apart. She was depressed and clung to her job, which seemed to be the only thing keeping her afloat. But then my sister and I received calls that she wasn’t showing up to work, or that she was making mistakes like giving people the wrong change back for their purchases. When she had to give up her job, it was a massive hit. I think she was terrified of coming home. It was empty inside that house, and she must have felt very alone. So many people I’ve talked to can relate to this loneliness and the heartbreak that emerges when one grapples with Alzheimer’s disease. My mom was married to my dad for 53 years, and after he passed, Alzheimer’s seemed to seep in and take over. It weakened her. Although I phoned her every day after dad died, I would just listen to her say the same thing over and over. Alzheimer’s had changed her before we even knew it had made its appearance. One day when I was back in Liverpool visiting mom at her house, we were watching television, as we so often did. She had always been very “house proud”; she was always constantly tidying up. I noticed that something was off about her television set. I got on my knees and put my finger on the screen and discovered it was thick with dust. The chill I got was all consuming. That is when we went to the doctors and had tests done, and soon after, I watched the light go out in her eyes. That was truly the beginning of the end, and my sister and I sought out a proper dementia care facility to help care for our mom. Although I could now afford the biggest and the best place for mom to live (and sort of wanted to show off that I could), my sister made me see that mom would want to be somewhere comfortable, and nowhere grand or opulent, as she had always lived modestly in a small house. We found a nursing home in Liverpool where mom could see the rooftops of the buildings where she grew up from her new bedroom. She regressed from that point on, often asking where my dad lived, or fell into moments where she thought she was 16 years old and asked when her mom was coming to see her. It broke my heart, but I never corrected her. What can you share about the Alzheimer’s story arc launching on November 17? How does this topic fit into the Y&R universe, and did you pull from your own life and experiences to tell this story? Soap operas, particularly in the United Kingdom, have always had a great tradition of taking real life issues and touching audiences with them. In America, Y&R was historically the first soap to feature this type of material. In my career, I have learned that I don’t want to preach to people. I’ve tackled the difficult topics through my television work: domestic violence, breast cancer, children with disabilities. But I am simply a storyteller providing a mirror to society, saying: “This is you.” Featuring these topics opens our audience up for discussion and it helps people grappling with these issues realize that they aren’t alone. We want them to see themselves in the characters, and they want to be heard. It’s my belief that drama should reflect the bad and the good of life, and I’ve always approached it in an optimistic way. As human beings, we take our knocks and build ourselves back up. We keep calm and we carry on. Soap operas can be very therapeutic for the audience, and I know from experience that if I’m in a room with 10 people, nine of them can relate to the topic of Alzheimer’s because they’ve experienced it in one way or another. As much as it’s important to include crime and love and comedy in the stories we tell as entertainers, it’s also greatly valuable to highlight an important health crisis and situation in life that millions of people can connect with. Rather than go the route of making a dull documentary, I choose to entertain and inform. We can depict Alzheimer’s in almost real time, unfolding the storyline week after week. Viewers that come along on this journey may feel pain, but they will also feel like part of the Abbott family, or see their own experience with the disease be reflected through the medium of television. It makes for amazing, important drama. You have a great history in television, and on your Twitter account you say your life is a soap opera. What opportunities did you see in taking this role on at Y&R? Was it always your goal to change the conversation, addressing a topic such as Alzheimer’s? As much as people focus on the drama of soap operas, I can’t resist doing comedy. It’s said that everyone who comes from Liverpool is a comedian! I always find the bright side of life, even in the tragic. Actress Marla Adams portrays Dina on Y&R. I put a lot of my mom into the Y&R character of Dina. She will sometimes say outrageous things, with no filter. It’s fun, funny and heartbreaking all at once. As entertainers, we are here to implore, to excite, to surprise and to of course entertain. Y&R may not be a public information source, but it can balance entertainment with knowledge that isn’t patronizing to our audience. Can you tell us a bit more about how Dina Mergeron’s Alzheimer’s disease will play out? What decision-making went into choosing this particular character and family for this story arc? The effects of Dina’s disease are far reaching and multi-faceted – not only does her illness take her from the position of powerful businesswoman to a much more vulnerable place, but it also erodes the relationship with her children that she’s worked so hard to rebuild. We want to show the light and the shade: the difficult, emotionally-charged moments for all affected, along with the lighter, even sometimes humorous side to the subject. We chose the Abbott family because Dina has a complicated relationship with her children, and the Abbotts place a large emphasis on their family legacy and name, and to watch those ties be affected and challenged in an emotional way will help us to portray many sides to such a complicated and relevant issue. How should we expect Dina’s diagnosis to impact her family and her relationship with children – and her children’s relationships with each other? What will it be like for the Abbott family to learn about Dina’s diagnosis after her being absent from their life for so many years? We see the Abbott siblings divided over their personal responsibilities to their mother, particularly Ashley and Jack. Dina came back to Genoa City to mend the rift between her and her children, and though it was not an easy journey, Dina became a readily accepted member of the Abbott family. However, when her disease begins to take hold, it becomes obvious that Ashley wants to avoid talking about the situation, while Jack wants to do everything in his power to stop it. This creates a divide between the two siblings, both in a professional and personal sense. Why was it so important to use your platform to address this topic? What would you say to people who don’t know much about Alzheimer’s, or who may think someone in their family is affected? The value of this storyline playing out week after week is that we can focus on those smaller, everyday details. We can show the whole journey, and viewers can engage whether they have been affected by the disease or not. I hope that viewers with experience with Alzheimer’s can relate to the material so that they feel less alone. People who don’t know about it need to know about it. I can pick up any newspaper and find a story about it. Unfortunately, it seems like it is much more prevalent than in the past. Organizations like the Alzheimer’s Association have brought this to the front, and the lines of conversation are open, not tucked away. No one has to be ashamed. There are lots of ways to engage with a soap opera. If we can help enlighten people – not educate, but touch and inform – we can be a bigger part of the conversation. We approach this story about Alzheimer’s with respect and plan to interpret it responsibility to our audience and all people affected by the disease. With drama, we go deeper. When it is time to be lighter, we want people to laugh with our characters. We want our viewers to dream and hope with them, because that’s what life is all about – emotions, connections. The human spirit is a powerful thing, and we plan to do it justice. I met my husband Steven in an organic chemistry class in college. There were handouts coming down the aisle, and Steven, who was sitting to my left, received the last one for our row of seats. Before I could do anything, he quickly jumped over the rows to the front of classroom to grab a handout for me, a knight in shining armor! We have been together for 41 years. Today, Steven is my care partner. Marriage isn’t an easy business – there are lots of ups and downs and the need to adjust to the many changes that come over so many years. My being diagnosed with Alzheimer’s in 2016 at the age of 65 was one of those changes. Although I am sure I ask Steven the same question over and over again, he never shows any frustration. I am so thankful to have him next to me. In fact, sometimes I feel like one of the luckiest people alive. I understand the denial many people go through when receiving a diagnosis of Alzheimer’s or dementia, especially if they are still part of the workforce. 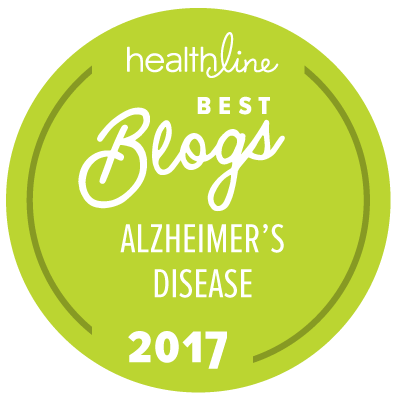 Not only was I diagnosed after retirement – a slight silver lining – but my mom had an Alzheimer’s diagnosis as well, at the exact same age as I did. Knowing my family history with the disease, my formal diagnosis brought both sadness and relief. I knew what was ahead and yet that also meant I could take steps to prepare myself for a different life, and I am grateful for that insight. Unlike my mother, I never had the desire to hide my disease from anyone. Yes, people react differently to the news. Some can’t handle it, and treat you differently, while others – as I’d like and want it to be – treat me the same. You can’t ignore the disease and you can’t predict how someone is going to react to the news. You can only tell them and move on and live the best life you can. When it comes to Alzheimer’s, it often takes a village. I personally went through fear, depression, acceptance…all the standard emotions that come with this kind of diagnosis. I saw several social workers, which was enlightening because the people I spoke with knew exactly how to help me through my experience. I would encourage anyone with dementia of Alzheimer’s to seek out this kind of support. It can be as valuable as the support one can receive from a caregiver or care partner. I also have found support throughout my community. From my experience participating in the Walk to End Alzheimer’s to the fantastic people from the Indianapolis chapter of Alzheimer’s Association, I am so thankful. I am in a walking club where I make positive one-on-one connections and I’m an active churchgoer, surrounded by people who care for me and who care about me. I come away from my encounters with this variety of dedicated people so uplifted – and more extroverted! He is a “teenage” Labrador-Australian Shepherd mix and such a joy! To call my new pup, Jackson, energetic would be an understatement. Two times a day, I take him for a walk that releases his boundless energy and helps calm me down. He doesn’t know that I have Alzheimer’s, and he doesn’t care that I do. He doesn’t change his demeanor around me and he doesn’t judge. He just loves me for who I am. Care and love can come from so many places: my husband, my son, my friends, my extended family and my rescue dog, who in many ways rescues me. To be supported on this journey is so important, and I honor each and every person who has been a part of my journey. It’s not over yet. About the Author: Mary received her Master of Science from the University of Illinois in reproductive physiology, and spent her career as a biologist, most notably working at the Indianapolis Zoo, studying the artificial insemination of African elephants. In addition to her work in the science field, Mary volunteered as a docent at the Indianapolis Museum of Art and was the editor of the Expatriate Magazine for American women’s Club in Belgium, where she lived for two years with her husband, Steven, and her son, who lives in New York City with his wife. This is great what you’re doing. My dad had Alzheimer’s. He passed just over a year ago, finally free. I miss him, but all the good memories mean he lives on. Thank you so much for raising awareness. That’s just a tiny snapshot of the tremendous reaction Teryn Schaefer received – and continues to – for wearing a simple, purple wristband. Today I’m wearing the @alzassociation purple band in honor of my grandfather on my show #TrendingOnTOUR. Please join us in helping us bring awareness and defeat this disease, together we can find a cure. She’s kept that purple band on ever since, including during the week-long, season-ending TOUR Championship in Atlanta this September. Teryn lost her beloved maternal grandfather – Frank Miller – to Alzheimer’s in 2016 at the age of 81, some 10 years after his diagnosis. She cherishes special memories sprinkled throughout her childhood, so much of it spent with her grandpa. A retired special education and elementary school teacher, Frank and his granddaughter were nearly inseparable during Teryn’s youth. In the early 2000s, Teryn’s grandmother began to notice symptoms of forgetfulness in her husband Frank. An avid reader and learner, Frank found himself having to re-read paragraphs from the page of a book he’d just read, and the word and number puzzles he’d once been a whiz at became more and more challenging to conquer. Teryn – who grew up in the small town of Waterloo – says her hometown’s proximity to St. Louis was fortuitous, for shortly after her grandfather’s diagnosis, doctors at St. Louis University conducted a research study with people living with dementia – and Frank was a willing participant. When Teryn graduated from the University of Missouri – one of the country’s most prestigious journalism and broadcast media schools – Frank was able to attend and see Teryn receive her diploma, though he’d long since been able to recognize her by name. “My grandfather was basically not himself for the last 10 years of his life, and that’s a really long time for someone to not even know who they are,” Teryn says. Unable to “process my grandfather’s death and figure out a way I can honor him,” Terynand the Alzheimer’s Association recently connected. Suddenly, the blurry picture of how she planned to support the fight to end Alzheimer’s came into greater focus. Teryn plans to participate in Walk to End Alzheimer’s in November in her adopted hometown of Jacksonville, Florida – and, of course, continue to showcase the purple band on her left wrist. About Teryn: A rising star on the sports-media scene, Teryn Schaefer hosts several shows for the PGA TOUR, including The Takeaway and Trending on TOUR, and is a contributor and host on PGA TOUR LIVE. In the United States alone, there are more than 15 million Alzheimer’s and dementia caregivers. During National Alzheimer’s Disease Awareness & Family Caregivers Month, we honor the people who serve as care partners and caregivers by providing tips for those looking to support these families living with the disease. Whether you are seeking to support a person with Alzheimer’s or the person that cares for him or her, you will find helpful ways to lend a hand – in ways both big and small. Educate yourself about Alzheimer’s disease. Learn about its effects and how to respond. Stay in touch. A card, a call or a visit means a lot and shows you care. Be patient. Adjusting to an Alzheimer’s diagnosis is an ongoing process and each person reacts differently. Offer a shoulder to lean on. The disease can create stress for the entire family. Simply offering your support and friendship is helpful. Engage the person with dementia in conversation. It’s important to involve the person in conversation even when his or her ability to participate becomes more limited. Offer to help the family with its to-do list. Prepare a meal, run an errand or provide a ride. Engage family members in activities. Invite them to take a walk or participate in other activities. Offer family members a reprieve. Spend time with the person living with dementia so family members can go out alone or visit with friends. Be flexible. Don’t get frustrated if your offer for support is not accepted immediately. The family may need time to assess its needs. There is no escaping the similarities between us. Mom and I look alike. We dress alike. (We both wore blue dresses on Rosh Hashanah, and on Sunday, we were wearing black skirts and white t-shirts, definitely unintentional on my part.) We walk alike. And our voices are somewhat similar, too, despite my American versus her British accent. I am reminded of these facts every time we are together. It is not something I can avoid: it is genetically determined. I keep wondering how it reflects on me. To what extent do people separate us as two distinct individuals and to what extent do they mentally connect us as being almost identical? I see myself in her. I, too, am aging. Will I become like Mom? There are age spots on her hands and arms, her toes are curling in, her eyes are sometimes watery. I can accept the physical resemblances. It’s the worry that there are also cognitive parallels that are harder to swallow. For me, I’m more used to thinking about myself relative to my children. As parents, we strive to make our children like us. As children, we’ve probably spent the better part of our lives individuating from our parents, finding our own path, rejecting so much of what they taught us and held dear. In both parent-child and child-parent relationships, the tangible and the intangible—common facial features and also tastes and desires—meld and war within us; we forget how alike we really are, so caught up are we in our struggle (and they in theirs) for independence. I haven’t lived in the same city as my parents since I was 18. That’s a long time to have sustained my separate life. And my children are not really at home now, either, having grown and chosen their own paths. Yet we are all genetically tied together. It is important to acknowledge our similarities—perhaps even embrace them. It is equally important to allow for each of us to maintain our uniqueness in our own generation. As with all children, I am a product of two parents. I definitely have my dad’s genetic material in me, too. In my immediate family, my brother Simon inherited our mom’s outgoing personality. I am more pensive, like my dad. And, yet, being with Mom, I must assume a more outward disposition. I run interference for her when we’re out walking. But I’m struggling with the notion that I cannot be responsible for Mom’s interactions with people. Not everyone we meet and talk to is aware of her Alzheimer’s, and I can’t quite tell them when she’s in the middle of explaining some nonsensical thing or angrily voicing her negativity that there is a reason for her odd behavior. It reminds me of when I was a little girl and wanted to disappear when my parents did something that embarrassed me (like speak English with a British accent). Except I’m an adult now, and I can’t run away. Once during a troubling experience with a friend, I was yelled at for being just like my mom. I took instant offense to that, being of an age where any reference to our similarities was an insult. Today, I understand that I am who I am because of the intellectual and emotional atmosphere in which I was raised. I thank God for making me similar to such a wonderful, loving, vivacious woman, one whom I dedicate myself to protecting as much as I can. And so I find myself eating honey cake, this being the season, its sweetness seeping into me and making my life a little more joyful. This is a light cake buoyed by the love I sifted in—and the egg whites. I ate my piece slathered in butter. It was really good. In a large mixing bowl, combine the egg yolks and oil and then add the honey and dry ingredients. In another bowl, beat the egg whites until stiff. Fold into batter. Pour into a loaf pan and bake at 350° for 30 minutes. About the Author: Miriam Green writes a weekly blog at http://www.thelostkichen.org, featuring anecdotes about her mother’s Alzheimer’s and related recipes. Her poetry has appeared in several journals, including Poet Lore, the Prose Poem Project, Ilanot Review, The Barefoot Review and Poetica Magazine. Her poem, “Mercy of a Full Womb,” won the 2014 Jewish Literary Journal’s 1st anniversary competition. She holds an M.A. in Creative Writing from Bar Ilan University and a B.A. from Oberlin College. Miriam is a 20+-year resident of Israel and a mother of three. Her parents recently moved down the street from her. Progressive and eventually debilitating, Alzheimer’s disease is devastating. Just ask anyone who knows or loves someone with the disease. Sadly, that includes many of us. Dom Moloney lost his grandfather, Arthur, to the disease. His wife lost her great aunt Milly, who was like a mother to her when she was younger. Dom is from the United Kingdom and works at PRA Health Sciences, where he is getting ready to be part of a cycling event with more than 100 of his colleagues from 15 different countries. PRA Cares: Vienna to Prague will benefit the Alzheimer’s Association, and from July 12-16, the team will travel approximately 100 kilometers (70 miles) per day. We spoke to Dom about the event and his personal connection to Alzheimer’s. Can you tell us about the people you have lost to Alzheimer’s? My grandfather, Arthur, died of vascular dementia and my wife’s great aunt Milly died of Alzheimer’s a couple of years ago. Arthur had a strong influence on me from a young age. He was a very spiritual man and had a brilliant sense of humor. He was there at many of the important moments in my life, including being my sponsor at confirmation. I have many happy memories of playing as a child at his house; holidaying together; and, after his wife died, helping him in his garden. My favorite memory was the first time he met my then girlfriend (now wife) but without looking up, assumed it was my sister. His first greeting to her was, “Hello O pregnant one…” Obviously everyone fell about laughing whilst my very slim girlfriend looked around for my very pregnant sister! Milly looked after my wife and taught her many life skills. Milly was very mischievous and always had a cheeky glint in her eye. She was always a little batty and often played for attention by pretending to forget things. This made it all the harder when Alzheimer’s disease set in, as we never knew when she was just playing around and when she really couldn’t remember where the bathroom was in her one-bedroom flat! What do you think is the most difficult aspect of the disease? There are many things that make Alzheimer’s difficult. The fact that someone you love not only doesn’t recognize you but sometimes thinks you’re coming to do them harm, or mistakes you for someone they used to love…it’s hard. One time, my grandfather saw my mother and her brother and asked where Margaret was. (Margaret was his first wife who had died a decade or more earlier.) When they broke it gently to him, he was distraught. It was only after several minutes they realized he meant my mother and just got the name wrong and hadn’t recognized her. Physically, Alzheimer’s destroys people. Milly was never a small woman and must have weighed 15 or 16 stone when she first went to the hospital. By the end, she had literally shriveled to a 5-stone shell with paper-thin skin covering her bones. She ‘drank’ water from a toothbrush as she was too weak to use a cup. What helped you and your family during this difficult time? We are very fortunate to have two sons of our own who were quite young at the time Milly was in hospital. They would often come to visit with us, and the people living with Alzheimer’s and dementia in the hospital would all coo over these beautiful children. Seeing the light that a little bit of youth brought to their day – or just someone to talk to – really cheered them up, which in turn helped us. Ultimately, we relied on each other as a family to get through the tough times. What advice would you give someone who might first be learning that a loved one has been diagnosed with the disease? Be patient and loving. Alzheimer’s confuses the person living with it and frustrates them enormously. Simply sitting with them and holding their hand is often enough for them. And use the periods of clarity – even when quite far gone, you may get short bursts of clarity where you’re recognized or a shared memory resurfaces. Grab these times and enjoy the moment. Be kind, be loving and cherish every moment. And when at last they pass on, rejoice that they are no longer in distress. Are you hopeful that we will find a cure? Alzheimer’s is a horrific disease and I have to believe we will one day find a cure. I never wish to see anyone suffer as Milly did – or her family and friends. Knowing your personal connection to the disease and the fact that PRA Cares: Vienna to Prague will benefit the Alzheimer’s Association, how does this cycle event take on added significance for you? Whilst I always loved cycling as a child, I’d not done it for 25 years until last year when my sister wanted to do a crazy challenge raising money for multiple sclerosis (MS) charities. We cycled up the Col du Galibier (a French Alp on the Tour de France route), raising £2500 (more than $3200) in the process. I loved being on the bike, out in nature and raising money for a good cause, so when the opportunity came up to cycle with PRA to raise money for Alzheimer’s, a cause that is so close to my heart, I had to do it. Last year, when the going got tough, I remembered those people I know battling MS. This year, I’ll remember Arthur and Milly; their memory will get me up the steep hills and through the last 10 km!